♫【Universal Compatibility】 The headset is with 3.5mm jack, compatible for iPhone 6 / 6s / 7 / 7s plus, Samsung, HTC, HUAWEI, LG, Sony, PC, Tablets, iPad, and other devices with 3.5mm Jack. ♫【Foldable & Adjustable】The headset is adjustable, you can adjust the length of band by yourself according to your size, and it is foldable, this is for saving space, and also convenient to take when you go outside or go travelling. 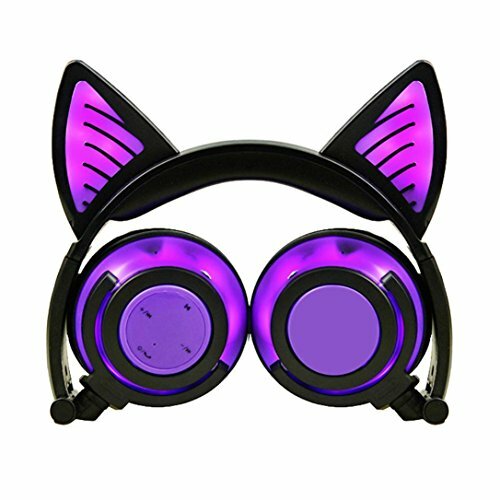 ♫【Designs】The headphone is designated in the shape of cat ears with the LED lights, the design is original and cute, the color is attractive. Ideal gift for children, friends and ladies. Also good for kindergarten / pre-school teachers. ♫【High Quality Sound】 Sound is good, enjoy music as soon as your music device is connected. Volume limited is safe to protect your children's hearing. ♫ 【Simple Operation】Open the button behind, the ear of headset will flash and change the color, item must-have for the Christmas party, the other evening party. These headphones can enhance the atmosphere of party.